Sunday 30th November saw the last major pre Christmas race of the calendar take place with the running of Wallingford Head, in very windy conditions. 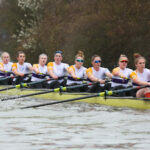 The strength of university rowing in the UK was displayed with the University Of London, Oxford Brookes and Newcastle University making up the fastest three crews in the both the men’s and women’s racing in Division 1. 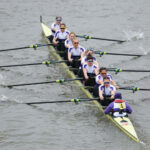 Three womens’ crews pulled on the purple to race, with the UL Women’s 1st Eight placing 3rd overall in both Division 1 and Division 2, winning the IM1 category in the afternoon. 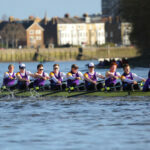 Three men’s eights also raced, with the UL Men’s 1st Eight finishing as the second fastest university overall. This was also the first time a UL student eight has beaten Newcastle since 2012. The mid-winter event provided a good indication of where UL athletes stand before the end of this term, and the upcoming training camp to Avis, Portugal in January. Wallingford Head was preceded on Friday night by the University Of London Boat Club annual dinner, at Senate House. Over 200 people attended the black tie event, including members of the 1963 Grand winning crew and the 1975 Ladies Plate winning crew, alongside current UL athletes. The fantastic event re-established the University’s support for the Boat Cub, and also featured a video message from UL athletes currently on altitude camp in Spain with the Great Britain senior team.